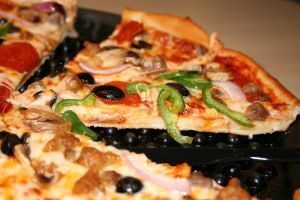 Use Coupons: Most pizza outlets distribute coupons that can save you money. These coupons can be found in numerous places: newspaper inserts, mailings, telephone books, coupon books, etc. If your pizza is delivered, there are frequently coupons pasted on the box. Internet: Sometimes there are specials online that aren’t available through phone-in orders. Always check the pizza store’s website before you order. Pizza Gift Cards: If you like a particular pizza brand that offers gift cards, check eBay. Many times you can get gift cards there for under face value saving you money on top of any other discounts you find. Consider Eating at the Shop: Many pizza shops (especially local, family owned businesses) offer dine-in only specials, most frequently seen as lunch specials and Family Specials. A dine-in Family Special could include free drinks, free dessert, salad or other bonuses and can make for an inexpensive occasional family night out. The other bonuses of dining at the pizza shop are no dishes to do at home, no paper plates/cups stuffing the trash can and no risk of a little one dropping a slice on the couch, rug, etc. Buy In Volume: Many pizza businesses have volume discounts such as buy one get the next one for $5. If you don’t mind cold pizza or reheated pizza, purchasing in volume will guarantee some leftovers that can make for an inexpensive lunch the next day. Plain Cheese Please: Order a plain cheese pizza and add your own additional toppings at home. Specials: Ordering specials rather than individually will usually save you money. Pizza shops often have a recurring special on a certain day of the week so get to know the schedules of your local shops. Pick-up: Instead of having to tip the delivery driver a couple bucks, go pick up the pizza yourself. However, if you live quite a distance to pick up the pizza, it may actually be cheaper to have it delivered and pay a tip than having to drive both ways. An option around this is to call in a pick-up order at a pizza shop that is on your way home from work. No extra driving involved, no delivery tip, and a piping hot dinner ready as soon as you walk in the door. Totally Homemade: Make dough from scratch by hand or, if you have one, use a bread machine. Add sauce and toppings of your choice. Semi-homemade: Buy ready made dough balls or prepared crusts at the supermarket and just add toppings. Either way, it will still be cheaper and, probably, healthier than ordering out. Letting everyone individualize their own pizza can be a fun and easy activity at a party. Take & Bake: If you don’t feel like making it from scratch, you can try take and bake pizzas (at a fraction of the cost of the big franchises). Store bought pizzas are getting to be better and better quality. Sometimes the toppings are a bit skimpy, but you can always add extra with whatever you have in the fridge or pantry. Non Typical Outlets: If you’re having a big party, consider getting your pizzas at Costco or some similar warehouse store. You can get a large amount of ready made pizza for a lot cheaper than you could get at a typical pizza shop. Saving money on pizza. Two of my favorite things ever. Homemade pizza is great. It’s never as greasy and pizza-shop pizza … sometimes bad, but most of the time good. Excuse my English, please. I am French student. Can someone explain to me please what it means “loosing a slice”? spelling mistake — should have been losing = dropping. Has been corrected.